Feeling a little worn out this morning, so here are some fun pictures to look at. in terms of scale for MFZ but still cool looking. 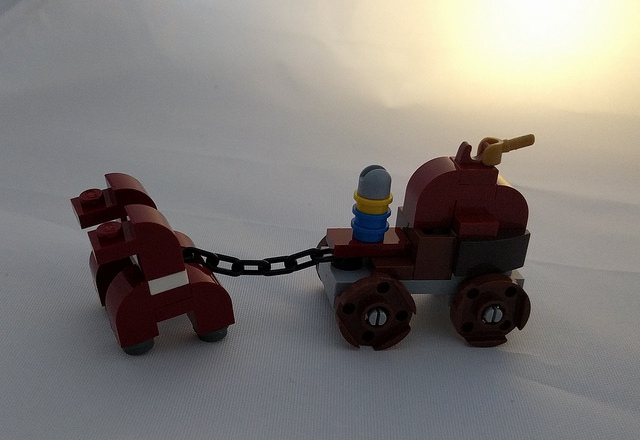 Lord Hephaestus's Fire-Horses Carry the Royal Chariot Into the Citadel at Sunrise by Tate Whitesell. In case you were looking for some fantasy themed pieces. Micro Helicopters by Clark Taylor. These are really slick. 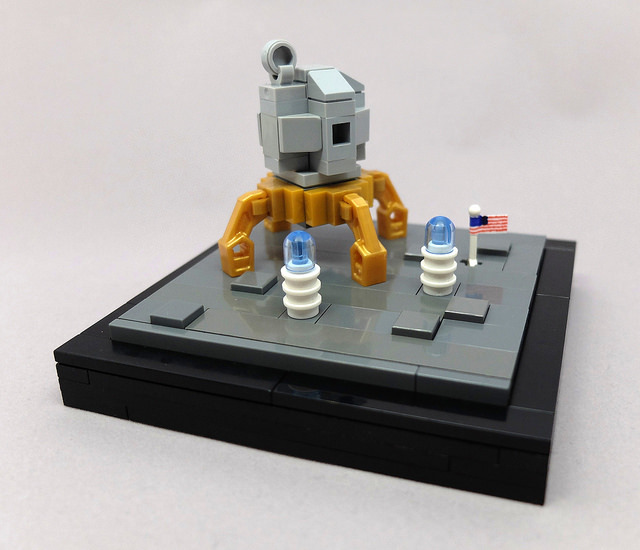 alternate for the lander from the Saturn 5 set. YF-19 Excalibur by zio_creation. Wow. But downloads are disabled. 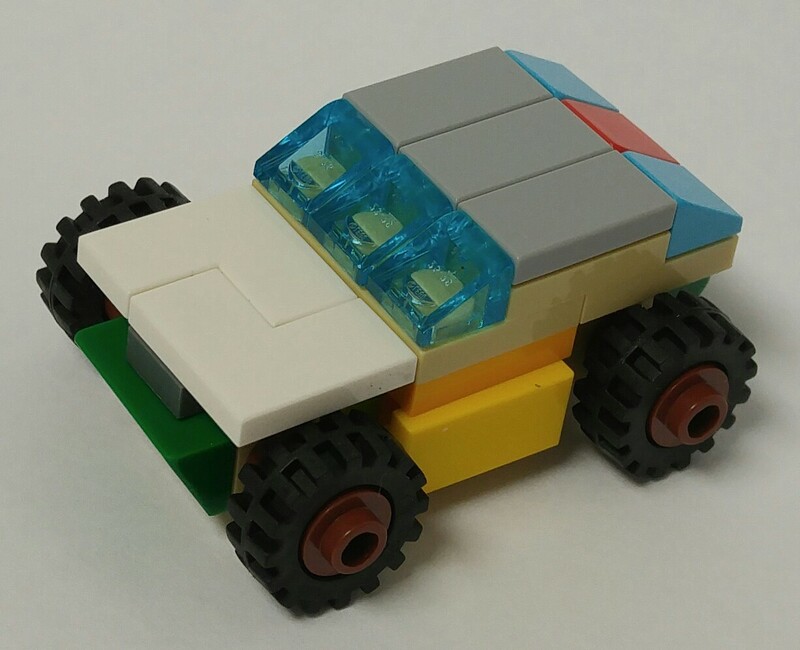 Years ago, Zizy posted a set of vehicles to his blog and they caught the imagination of the MFZ community. Zeekhotep talked about them on his blog. They were discussed on the Hangar. And they've been discussed on the Discord channel as well. Zizy calls them 1/72 scale and Zeekhotep says they're perfect for 7P scale. After the discussion on the Discord channel I figured I'd take a crack at them and see what I could do. 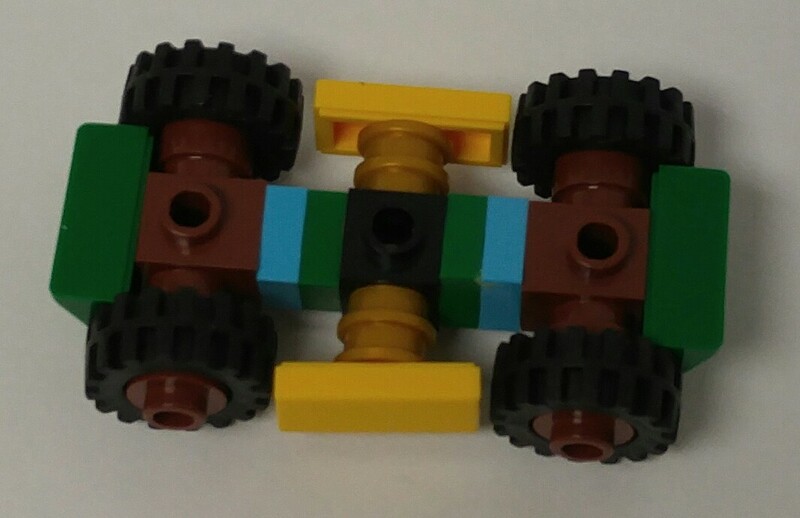 Here's my first attempt at the chassis. This worked, but the rest of the vehicle was only attached by one stud and was able to rotate out of position. and didn't allow it to rotate. Here's what it looks like fully assembled. looking color scheme and make it look a little "sportier". Then I went a little nuts and built a bunch more, including an "18 wheeler". Here's a size comparison shot. Here's the Brickshelf gallery for these builds. Hopefully this gives you the first step you need to assemble your own. I stopped in to Dollar General after a night out with friends and I found some new sets on the shelf. I wasn't intending on reviewing more Kre-O sets for a while but I needed the parts from this one. 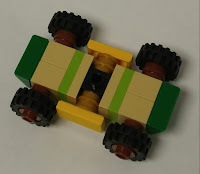 I'm going to use the Non-Building Block review system for these since they look like they could be a Frame-in-a-Box. Disassembled. 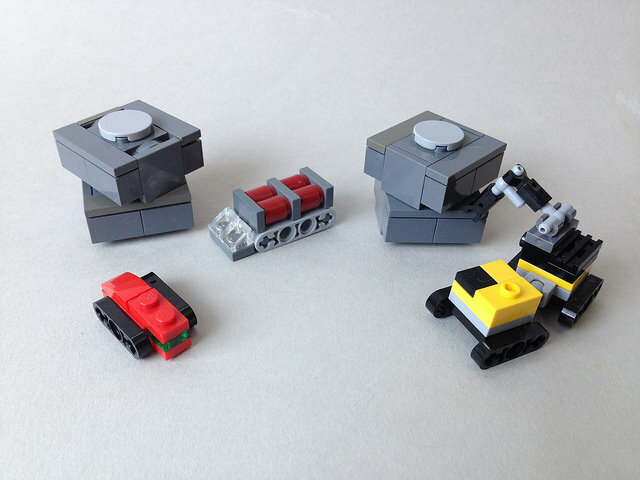 Those Bar Tile Clips by the Kreon's legs plug into Lego Apollo Studs. The Clip-On Gatlings are neat, and the Autobots symbol on the 1x1 Round Tile is neat too. and 1B for the armor on the back. Bag. I paid $5.00 for a $0.13 Price per Piece. corner are the new Flower pieces though. Build. A couple of small Stations. Score: -5 (B-). Buy it if you're a completist .or really need the parts. Looks like Target is running a 20% off sale on select Friends, City, Classic and Duplo sets. That means the Classic sets should be a really good deal and the City sets might be affordable. Here's Toys'R'Us clearance sale on building blocks this week. I picked this up the other day at TJ Maxx for cheap, so I decided to do a quick review. Box. MSRP was $11.99 for a $0.21 Price per Piece. Minifig. That helmet might be fun. Parts. Technic Bricks, Brackets, Plates, Bars, Tile Clips, Clip Plates, Bar Plates, Friction Pins, Pin Axles, Slopes, New Headlight Bricks, Dimensions Bases, 2x2 Trans-Light Blue Round Brick, Round Tiles, Flame pieces, Minifig Axe Blades, Ice Cream Cones. Score: +5 (B+). This is more a parts pack in my opinion.